Turn The Towns Teal® is a national campaign to promote awareness of ovarian cancer, its subtle symptoms and risk factors. During National Ovarian Cancer Awareness Month in September, our volunteers call attention to this disease by tying our USA-made ribbons in various locations like town centers, businesses, places of worship, neighborhoods and on their individual properties. There is NO conclusive early detection test for ovarian cancer which is why this awareness campaign is so very critical. 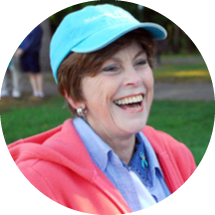 Turn The Towns Teal® was founded by Gail MacNeil of Chatham, NJ, who was inspired by her own experiences. During Gail’s ten-year battle with ovarian cancer, she realized first-hand that not enough was being done to publicize the symptoms of the disease. She wanted to spare others what she and her family endured. Gail was fastidious about her health and went to her gynecologist on three separate occasions complaining of classic symptoms; however, her doctor dismissed these symptoms as merely the onset of middle age. On December 23, 1997 Gail was diagnosed with Stage IIIC ovarian cancer. Gail had laid the foundation of Turn The Towns Teal® and set forth certain guidelines for the campaign including the requirement that ribbons be put up in the beginning of September and taken down at the end of the month. She also required that volunteers receive written approval from their towns about placement of the ribbons. She started this campaign in 2007 at which time 20 towns in New Jersey participated. By 2015, we had registrants in all 50 states as well as in Canada and Bermuda. In 2009 Gail’s husband trademarked the name Turn The Towns Teal®, and Turn the Towns Teal®, Inc. was formed. Subsequently the trademark was assigned to the new corporation which was later granted 501 (c)(3) status as a non-profit organization. Today, the campaign is being carried forward by The MacNeil Family and a group of dedicated volunteers. Gail was also a co-founder of The Kaleidoscope of Hope Foundation (KOH) in May 2000, along with two other ovarian cancer survivors, Lois Myers and Patricia Stewart-Busso. KOH’s mission is to raise funds for ovarian cancer research and increase awareness of the symptoms of the disease. Since its inception, KOH has contributed more than $2 million dollars to organizations and institutions involved in ovarian cancer research and disease advocacy. Walkathons take place in Morristown, Lyndhurst and Avon-by-the-Sea during September, in recognition of National Ovarian Cancer Awareness Month, to help raise funds and awareness to further the mission of KOH. For more information, please visit the KOH website at www.kohnj.org. *Our officers do not receive any compensation from the Turn The Towns Teal® organization.